Rutger plays John Ryder (a clever name, huh?) and he's certainly one nasty dude. 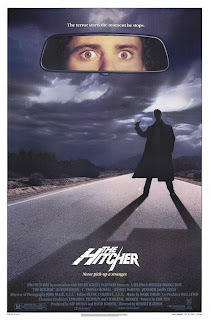 The entire film takes place along a stretch of nearly deserted Texas highway and within five minutes Screenwriter Eric Red lets us know that the "rule of thumb" has a far different and menacing meaning when it comes to this "hitcher." "He came from hell. Don't ask him where he wants to go." 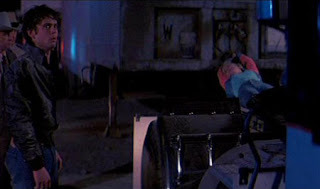 C. Thomas Howell is cast as Jim Halsey, the unlucky and feeble-minded young driver who stops to give Mr. Ryder a lift. Unfortunately, it is extremely difficult to get emotionally involved with the plight of our protagonist. Howell's on-screen persona is about as vanilla as the Smithson Valley High School Glee Club; they just as easily could have cast David Dewhurst had the Lieutenant Governor of the Lone Star State auditioned. If Rutger Hauer is the on-camera reason for THE HITCHER's cult status, then the screenplay deserves much of the behind-the-scenes credit. Yes, there are even more plot holes than pot holes to be found along this barren, backwoods TxDOT blacktop, but the stark, minimalistic, almost stream-of-consciousness style used to advance the story is highly effective. The real kicker for THE HITCHER, however, is the sly homosexual guilt undercurrent that exists between the two main male characters. This added element of tension elevates Eric Red's screenplay to a level that none of the numerous sequels or remakes or retreads come close to accomplishing. Needtovent gives THE HITCHER four thumbs up -- and one thumb down for the Texas Department of Public Safety patrol car that is seen with California license plates.